I bet you’ll never guess why I love this one. Could there BE another cuter, pinker drink than this prickly pear margaritas, said Chandler Bing. Just look at that shade! Wildly gorgeous and completely natural. Between these prickly pears and my pitaya obsession this summer, my skin might turn hot pink. Not complaining one single bit. So what do these gorgeous little pink pears taste like? Oh. Let me tell you. I think they taste like watermelon gum. Like watermelon bubble gum. I actually googled what they are supposed to taste like because mine seemed almost too good to be true, and wouldn’t you know that I saw both bubble gum AND watermelon juice?! And cotton candy. They sort of taste like that too. In short, they taste like a unicorn fairy prancing on a rainbow. Don’t you want to drink a unicorn fairy prancing on a rainbow?! I mean. The thing is though that they are NOT overly sweet. It’s a natural flavoring of watermelon gum, if there could ever be such a thing. That’s why I wanted to add something with a bite to it, a flavor that could take us further into fall with a hint of spiciness. Enter ginger beer! Gosh, I freaking love ginger beer. Fever Tree is my favorite brand and it tastes fantastic, making me never want to drink ginger ale again. I topped the drink off with the ginger beer which made it not only delicious but also a little bubbly, which I adore. It’s unique to most margaritas and the fizz is such a welcomed addition. Also, let’s talk about how deprived I feel for not discovering prickly pears sooner! And pumping my guts full of artificial cotton candy flavor while this beauty was right there the whole time. These adorable things are in season through the holidays so the whole pink + green combo can also be your holiday cocktail of choice! Place the salt on a plate. Rim a glass with a lime wedge and dip in the salt to coat. Fill the glass with crushed ice. In a cocktail shaker with ice, add the tequila, grand marnier, lime juice and syrup. Shake for 30 seconds. Pour mixture into the glass, then top it off with the ginger beer. Add a few lime wedges and stir. Drink up! Place the pears in a food processor and blend until pureed and “juiced.” Strain the juice through a fine mesh sieve. However much juice you have is how much sugar you want! If there is 1/3 cup juice, you want 1/3 cup sugar. Place the juice and sugar in a saucepan and heat over medium heat. Whisk until the sugar dissolves and the mixture starts to simmer. Going to drink this in my hologram shoes and Lisa Frank leggings. Just kidding! Not. YUM! The only prickly pear flavored thing I’ve ever had was a lollipop probably like 15+ years ago..random I know haha. I barely remember the taste but I do remember it being kinda cotton candy-y. I’m definitely going to look for them in the store now! I love prickly pear. And Pitaya. They’re so bright and perfect for drinks. I can’t wait to try the prickly pear and ginger beer combination!! beautiful! throw in a few pom arils and BOOM, holidays! Yum! Too bad the prickly pears I have right now are the white-ish variety. I am now on the look out for pink ones! what do the white ones taste like?! i’m so intrigued. I miss Texas where you can get prickly pear flavored beer (Shiner is the best) and prickly pear kombucha. I seriously doubt I’ll be able to buy prickly pears up here in Alaska, but if I happen upon any in the store, I’ll buy them up and make this drink straight away! Looks super yummy! oh my GOSH!! i need some of that! Here’s an article about the Shiner Prickly Pear beer (http://www.usatoday.com/story/money/personalfinance/2015/05/24/beer-man-shiner-prickly-pear/27750871/). Remarkably I found it this summer at a small liquor store in Fairbanks, AK, so there’s maybe hope that you’ll be able to find it outside of Texas (although maybe just during the summer). Here’s the brand of prickly pear kombucha that I used to drink a ton of in Texas (https://www.facebook.com/HolyKombucha/?fref=nf) – I found it at Whole Foods (and equivalent) stores, so it’s possible that you could find it up North as well. I grew up in Tucson, AZ and used to have so many prickly pear cacti in my yard! They have the prettiest flowers- I even got some tattooed on my arm. Every summer I’d pick the pears with my mom and make prickly pear lemonade. Prickly pear margs are my all time fave pink margarita. I’ve heard of prickly pear but had no idea what it actually tasted like. The idea of a fruit tasting similarly to gum and cotton candy and watermelon – I don’t see why more people aren’t raving about it! good article and new innovation.Thank a lot’s and i am waiting for next post. 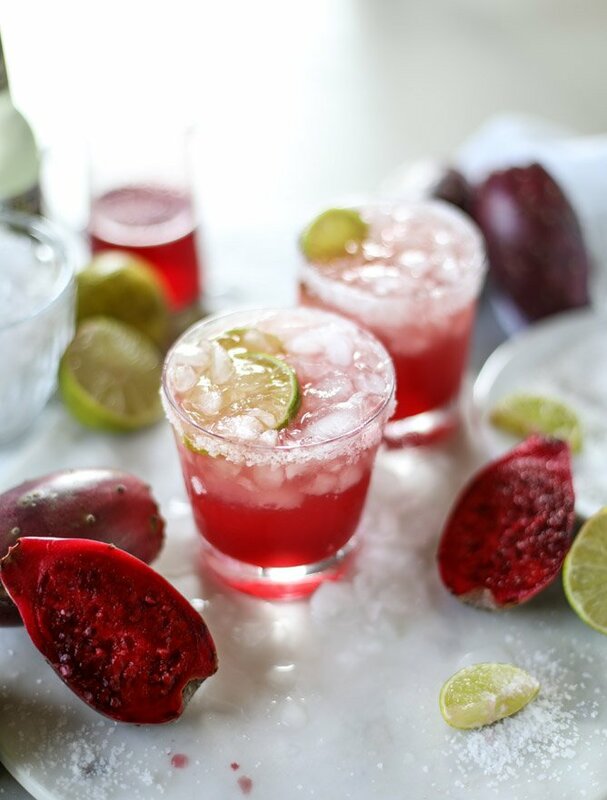 Love, love prickly pear margaritas! The addition of ginger beer is fantastic! Fresh prickly pears have always seemed intimidating, but I think I can do it!